It is difficult to envision a better way to have capped off the UFC’s 25th birthday event than the final two fights of UFC Fight Night 139. 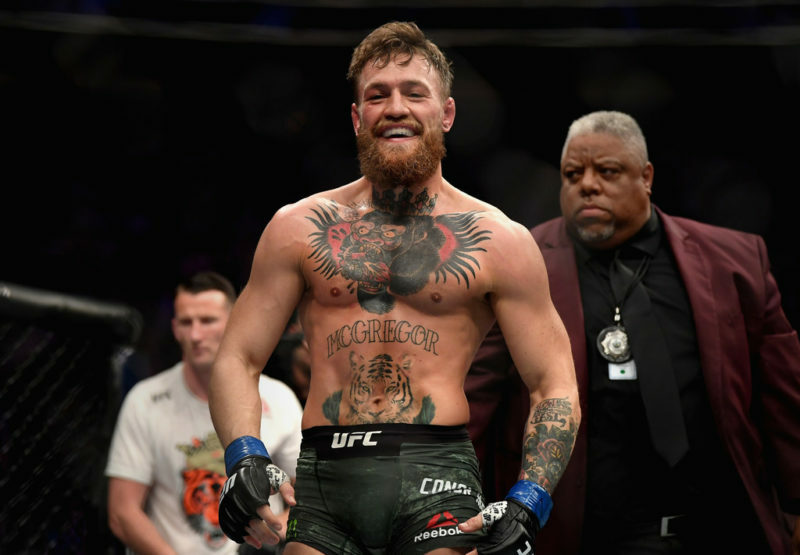 The card culminated with two bouts that showed us everything we love about mixed martial arts – expert technique, impressive displays of heart, and the resulting submission and knockout finishes that are the perfect end to a spectacular bout. 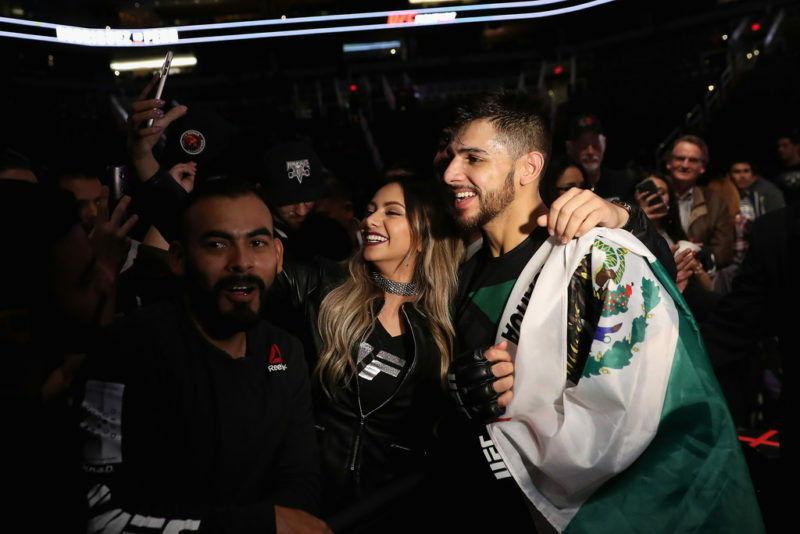 While Yair Rodriguez’s last-second knockout of the Korean Zombie is the undisputed highlight of the event, Donald “Cowboy” Cerrone’s first-round submission victory over Mike Perry should not be overlooked. While there were many feasible ways that this fight was predicted to end, an armbar from the guard did not seem the most likely. In an attempt to prevent this spectacular display of skill from being overshadowed by its successor, we’re going to break it down and explain just how it was so effective, and spectacular. The fight made its way to the ground when Perry secured a double underhooks body lock and took Cerrone down. Cerrone then used a particularly impressive variation of a turtle sweep to secure top position, (a breakdown for a different time) and momentarily took Perry’s back before being shaken off. Immediately after being put on his back, Cerrone established his guard, placing his feet on the hips of his opponent and grabbing double wrist control. 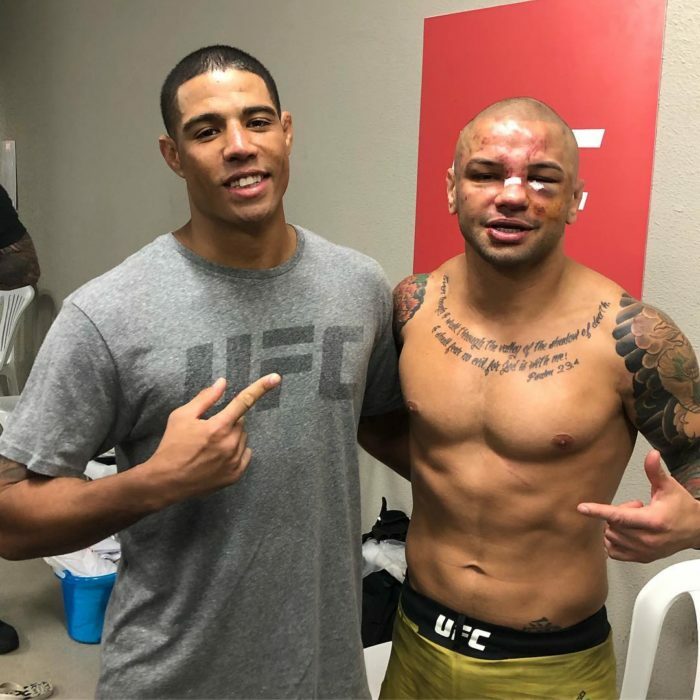 One of the most important facets of having an effective guard in MMA is to attack quickly, catching your opponent before they have the time to settle their balance and start landing ground and pound. Cerrone has clearly internalized this ideology, immediately stuffing Perry’s right hand and advancing towards a triangle choke position. The double wrist control grip utilized by Cowboy is incredibly effective at allowing the guarder to clear out the opponent’s hands but does little to stop the opponent from posturing up as there is no control over the head. Perry defended correctly, posturing up to create enough space to slip his right hand in, nullifying the choke attempt. While this was successful in warding off the strangle, the result was Cerrone establishing a high guard position, with his legs up near the shoulders of his opponent. The high guard position offers a plethora of sweeps and submissions, as the attacker’s legs only have to travel a short distance to get around the opponent’s head for arm locks and strangles. 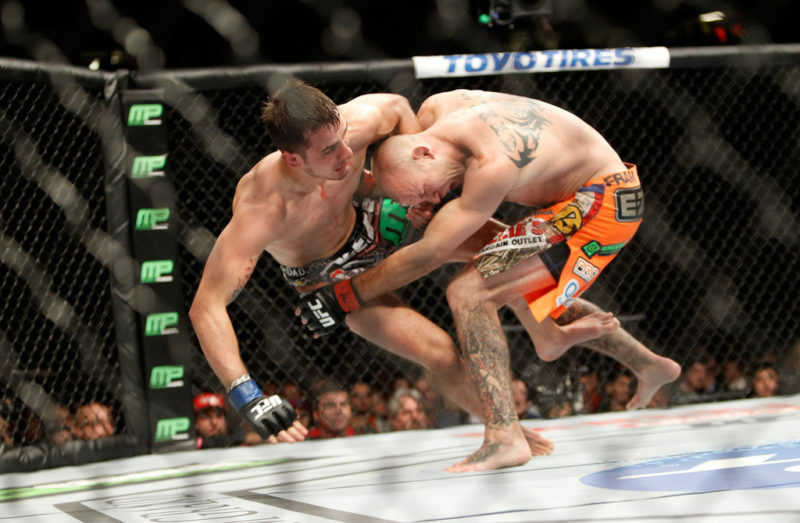 Notice the picture of Cerrone’s high guard as opposed to a standard low guard below. As summarized nicely by commentator Paul Felder during the exchange, “he’s out, but he’s not safe,” referencing Perry’s escape from the triangle, but not from danger. Cerrone’s high guard has his legs up high on his opponent, which offers defense against strikes and numerous sweeps and submissions. A standard guard is less effective than a high guard, as the legs are low on the opponent, offering limited options of defense and attack with his high guard established, Cerrone elected to use this advantageous position to pursue another submission attempt, establishing an upwards grip with his left hand on Perry’s right arm. The upwards grip is incredibly effective at either stuffing the opponent’s hand into their own chest or pushing it up and away, hence the name. Both of these maneuvers are powerful setups for the triangle choke. Having just fended off a triangle attempt on the same side, Perry decided to stack into his opponent, attempting to take away the space needed for another attempt at the triangle. While this action did prevent a follow-up triangle, Perry’s decision to pressure forward forced him to put his left hand on the mat behind Cerrone’s ear to stop himself from falling over. Cerrone establishes an upwards grip with his left hand and wraps up Perry’s left arm. Cerrone recognized that the stack had stifled his attempt at another triangle, and elected to switch tactics. He quickly wrapped his right arm around Perry’s left, trapping it high up next to his head in a near-perfect position for an armbar. In one final attempt to stop the inevitable attack, Perry stepped his feet in closer to Cowboy, likely thinking he could explode up and rip his arm out of danger. 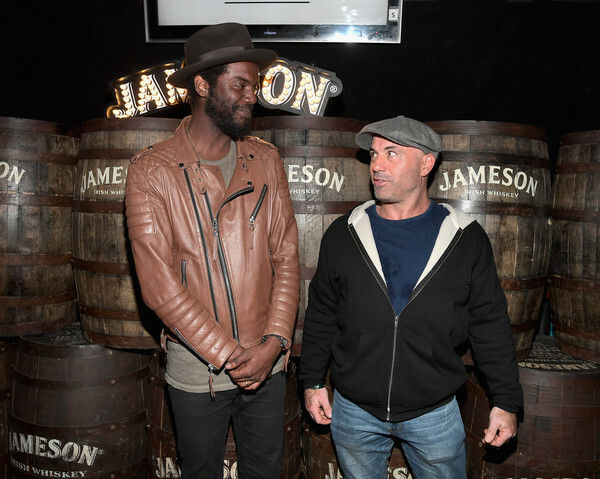 This was not an unfounded decision, but Cerrone is an expert grappler who knew how to counter. 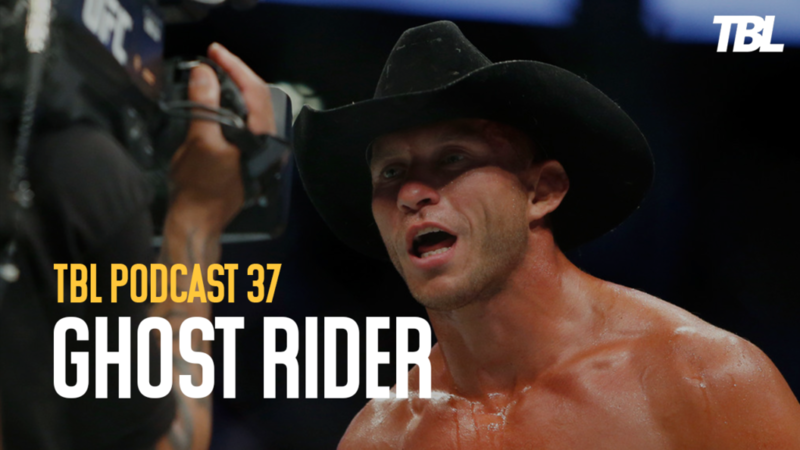 Cerrone seized on his new proximity to his opponent’s leg, and in one fell swoop he underhooked the leg, pulled himself to the coveted 90-degree angle necessary for an armbar, and slipped his right leg over Perry’s head, locking up the submission. Notice in the slowed-down clip below, Cerrone underhooks Perry’s right leg and pivots for the armbar immediately as Perry stepped it in. 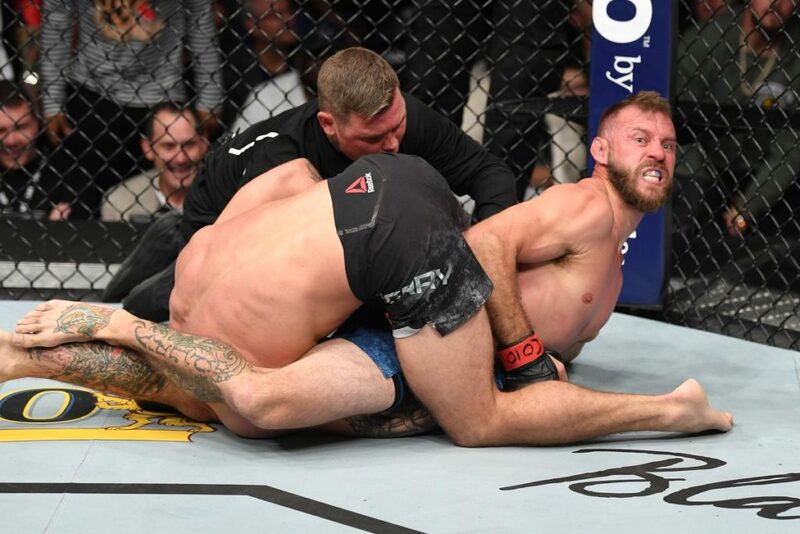 While Perry’s decision to bring his legs in close to Cerrone gave Cerrone the ability to swivel for the armbar, it also resulted in Perry’s hips directly over his knees, which allowed Perry to immediately explode up, bringing his opponent with him. Cerrone was unwilling to let go of his submission attempt, deciding to take his chances on surviving the slam. Perry crashed his parasitic opponent head first into the mat in an attempt to knock out his undesired passenger but to no avail. This highlights Cerrone’s single mistake during the grappling, not holding onto the leg he had underhooked. While he did survive the slam, wrapping his left arm around Perry’s right leg would have anchored him to the floor and eliminated any slam attempt. The exchange was near instantaneous, with the time between the start of the armbar and the slam being a mere three seconds. Post slam, the pugilists ended up in a belly-down armbar position, which provides substantial levels of breaking power for the attacker, and limited methods of escape for the victim. Realizing he was still conscious, Cowboy drove his hips into Perry’s arm, breaking the joint and forcing his opponent to submit. 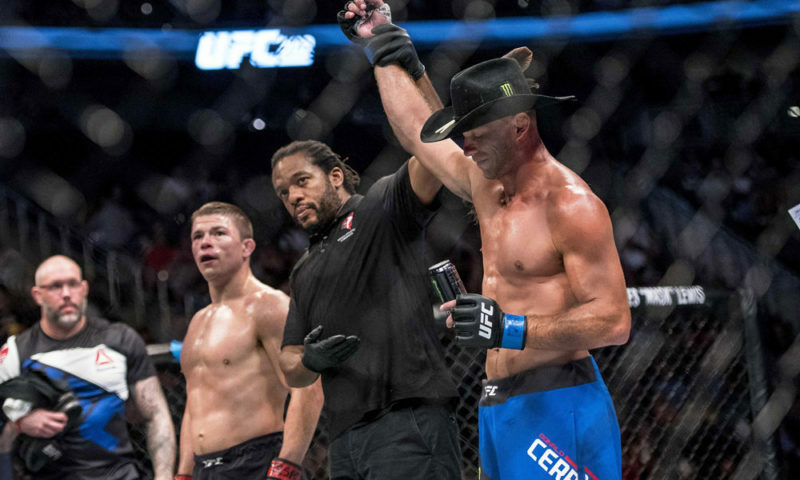 With this impressive submission victory, Donald “Cowboy” Cerrone simultaneously captured the record for most UFC wins, and most UFC finishes. Whatever one thinks about “Cowboy’s eccentric personality, there is no doubt that he is a top-level competitor and impressive martial artist. While it is likely to be eclipsed by the breath-taking knockout in the bout that followed, Cerrone’s wild submission victory to simultaneously clinch two UFC records was a perfect way for fans and fighters alike to celebrate the UFC’s 25th birthday. Here is the sequence in its entirety.